Whether it's sitting in the film room for hours on end watching coaches draw up plays on the whiteboard, or going home and absorbing an expansive playbook, the methods that NFL players are using to prep for games are still pretty old school. The introduction of tablets housing X's and O's acted as one of the first evolutions in this area, but there's a much bigger platform on the horizon: mixed reality. Several teams have already enlisted the help of VR programmes in order to help mimic practice or a game experience for quarterbacks, but one startup, Mixed River, is aiming to jump ahead of the pack and ride the next technological wave. MixedRiver PRE-GAME PREP Header from Mixed River on Vimeo. Based just north of Baltimore, the startup was founded by Jim Pietila and Carlson Bull, both of whom have backgrounds in VR and mobile AR. 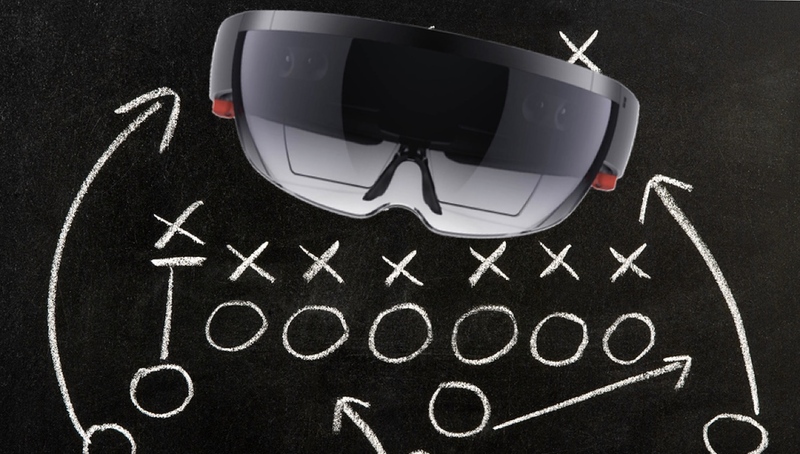 Mixed River is aiming to use its Pre-Game Prep platform and a Microsoft HoloLens headset to provide players with holographic representations in practice and prepare them for the real thing when game time comes around. "We started looking at the technology when the HoloLens emerged, and at that point it was all about what the business aspect was and how it could be useful," Pietila said. "Initially we looked at creating an entire platform, but there's a lot involved with trying to do something like that, so we instead decided to focus on sports, and chose football as a primary subject within that. We looked at other sports, but we just felt that football fit best, and the fact the Baltimore Ravens are so close also made sense to market it for those guys." The nearby Ravens, as it happens, have just struck a one-year deal with Mixed River, with training camp recently opening and the 2017-18 season looming. But what comes with the package, and what tools will Mixed River provide to coaches and players to practise with? As Bull describes, the system – which was created through the Unity 3D engine – is able to capture the input of plays and bring it to life through a tablet, a projection on a wall or even through a holographic team that players can line up against on the practice field. The holographic portion, which allows players to move around and experience the technology in an open environment, was one of the key forces pulling the pair away from VR and instead focusing on MR, as Bull explained. "We have a pretty extensive background in VR and mobile AR, but I think with VR and some of the executions that are out there right now, while there's some use and validity in them, they're closed off and it's a single point of view. "You can't move around in the same way and it's not really applicable to any point of view other than the quarterback," he added. "With what we're doing within MR and Pre-Game Prep is allowing players in any position to experience this. So you could be the quarterback, a safety or a running back and still be experiencing these plays." While Mixed River is looking into the future with regard to how the VR and MR space is shaping up, it also has the opportunity to aid the NFL's broader issue of player safety – specifically, concussions and chronic traumatic encephalopathy (CTE). After all, in a recent study by the American Medical Association, the degenerative disease, which can only be diagnosed after death, was found in 110 of the 111 former NFL players who donated their brains for research. "I'm not sure how many concussions occur in practice, but I'm sure they do," said Pietila. "The beautiful thing for us is that the NFL is concerned about it, so they've said to teams that they need to do more mental practice in the form of classroom time or walk-throughs. "I'm not sure if there are ever going to be any statistics that will say concussions are reduced because of this technology, but if you think about when players get hurt, it's when they aren't expecting something," he added. "They get hurt when they're going half-speed in practice. When you're going full speed and you know what's happening around you, the odds of getting hurt are significantly less." PRE-GAME PREP - Mixed Reality/HoloLens System Testing 07.2017 from Mixed River on Vimeo.In spite of all the strengths in Mixed River's platform, its technology does face some battles, too. One of its most fundamental is that coaches don't tend to embrace change, as Pietila explained. In spite of the many strengths in Mixed River's platform, its technology does face some obstacles, too. Perhaps the largest of those obstacles lies with the coaches, many of which don't tend to embrace change, as Pietila explained. "We've bought into the use of MR, but the fact is there's limitations both on the technical side as well as the adoption side," he said. "When we first built our proof of concept, we had people guiding us to what makes sense in terms of what we offer. People loved the technology, but we had to dial it back and use a different approach in order to present it to old school coaches." And while the pair both explained how players are on the other end of the spectrum and can quickly jump into the tech, it also faces the issue of AR hardware playing catch up with the software. Bull and Pietila are well aware that progression in AR lags behind VR, but they're confident the space will soon see a boom. "I don't see it as taking too long before we can spread this technology," Bull said. "To some extent, the hardware needs to catch up, but given the players building MR systems – Microsoft, Apple, Magic Leap, the dozen others – I think the overall price point will come down and the processing speeds will go up. I would say a year from now we have at least the beginnings of a wider spread adoption." Until then, Mixed River will be providing the Ravens with a platform to prepare for their 2017 schedule. And while technologies such as this are often kept under wraps by teams in order to gain an advantage over opposition, Pietila confirmed the company is talking to other teams from around the league. Whether its first run with an NFL franchise marks the beginning of greater adoption for the company remains to be seen, but it's hard to deny that it has the tools at its disposal to make a significant impact on the way players learn and practise over the coming years.